The best way to have a painting examined is to bring it to the studio. Here a painting is safely removed from the frame and its condition is thoroughly assessed. 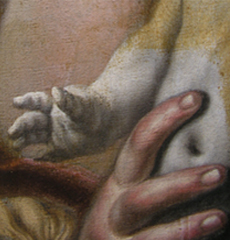 If the painting appears to need cleaning, a small cleaning test is done at the edge. Every treatment that the painting needs will be clearly explained. The cost of restoration is determined and agreed upon in advance. A written document outlining the condition of the painting and proposed treatment is issued for each painting left in my care. Pre-buying consultation – Are you considering buying a painting but are unsure about its condition? Does it look too good to be true? Is it a painting or a print? Was it restored in the past? If so, to what degree? How much would the restoration of the painting add to the overall cost of your painting? Is the signature legitimate? Are the stretcher and the frame original to the painting? I can help you answer these questions. Examination of the painting's condition – A knowledgeable look at the painting through the eyes of a restorer/conservator. The overall condition of the painting is thoroughly evaluated and if needed, restoration treatment is suggested. Collection evaluation – A complex, comprehensive look at a collection of artworks to determine possible issues and help with general maintenance. ♣ Are the paintings properly displayed? ♣ Do some of the paintings need a fresh coat of varnish or gentle dusting? Artist research – Many artists' signatures are either difficult to read or have been damaged. A little bit of detective work and cross-referencing with many sources can often lead to deciphering the artist's name. When the artist's name is known, a great deal of information can be found out about previous sales, valuation of the paintings, and more. On-site examination and treatment – Some paintings are either too large or heavy to be easily transferred to the studio. In such cases, the evaluation of the condition and sometimes even some restoration work can be performed on premises.